Shot clocks are the number one solution everyone comes up with. I heard on the Golf Channel Morning Drive someone brought up the point of the NFL and NBA having a play clock and shot clock respectively, so why shouldn’t the Tour have a shot clock? I’m much against this comparison where in both the NFL and NBA cases, they have those rules to disallow a team with the lead to waste time to run down the clock. If CBS set a hard time limit for a PGA event to end and 60 Minutes to begin, and declared that whoever was leading at that time won the tournament, then yeah, put a shot clock on them so they don’t waste time with the lead. Soccer is another example where we see the same thing with late substitutions where the player coming off the field takes his sweet time walking to waste time. In that case at least, the ref can add more extra time to the end to make up for it. Judging how much time a player deserves to hit a shot raises judgement, which is impossible for people to agree on. Here are some examples of what can cause issues. If a player is standing over the ball and the ball rolls off the tee before the swing, is he allowed to re-tee, step back, focus, and get over the ball again even though by then it’s longer than the allowed time? On a difficult green, how long does a player have to read the putt? Does a player deserve more time to look at a putt on his 18th hole of the tournament compared to his 72nd? I consider myself a pretty good putter. I know of two cases coming to the end of a round where I spent more time reading a putt than normal to make sure I read it correctly and confidently while the others in the group had finished and were standing. Since that’s not usually considered acceptable I felt like garbage to the point that I apologized for how long I took to hit the putt.. Both times the guys said no problem cause they knew why I was reading that much. When does the theoretical shot clock start? When the player arrives to the ball? What do we mean by “arrive”? Would I be able to stand 10 yards behind the ball, do all the calculation I’m thinking of, and then quickly walk to the ball and hit? How much of a difference does analyzing the upcoming shot take as opposed to simply standing over a shot before taking a backswing? All of these are judgements, and people will disagree. If we’re comparing other sports’ play clocks again, an NFL ref can reset the play clock if they judge a slowdown occurs that isn’t the fault of any players. I suppose that could be what happens in the golf world? Do you have a ranger for each group with a stopwatch who shows the time left for the shot? So if they see it fall off the tee, how much time do they get after? No matter what, with a full rule change, we’d end up with cases like Haotong Li where the rules down to the word are followed, but nobody would come close to thinking he deserved a penalty. Edge cases are never good to have with rules, and pace of play rules easily would be the worst at that. Continuing on time comparisons, chess has an interesting rule about how long each player is allowed to think about which moves to make throughout the entire game. If we used this rule in golf, players each have a full time limit from ball arrival to hitting their shot during the entire round. So if they need to stop and think more, they’ll want to make sure later in the round to be quicker. That’d be an interesting rule to try, but along with the per shot shot clock, way too many additions would have to be made. The type of players in your group can really affect how you perform. Clearly a slow player will impact you, but a quick player can make you feel bad for being slower than they are, and that can have an impact as well. I’ve come across both types. Although like pitchers and batters sometimes do in the MLB, golfers usually aren’t adjusting their pacing to mess with competitors and gain an advantage. At what point should a player talk to a rules official to get a timer on the slow guy? On my end, it’s a little brutal to be calling someone out for that. Then again, I don’t know exactly how important Tour players’ relationships with other Tour players are. Maybe they don’t care about calling someone else out – it seems like it happens on all the time on Twitter. It’s worth it to mention public, non-tournament pace of play problems where a lot of times courses have their own rules. At Radrick Farms in Ann Arbor, huge favorite course of mine, if your group is a complete hole behind after the turn, meaning the group in front has already finished the 10th hole, you’re told to skip the 10th hole and go to the par 3 11th tee. The 9th is a drivable par 4 where we have to wait for the green to clear a lot of the times. Clearly we’re going to be waiting on the tee and the group in front gets that head start. There were times when we were that full hole behind after the 9th, played the 10th at normal pace, and then had to wait on the 11th. At San Francisco Golf Club the caddies have their rules, where players are always in charge of replacing divots while the double bag caddies walk quickly to where the shots landed. 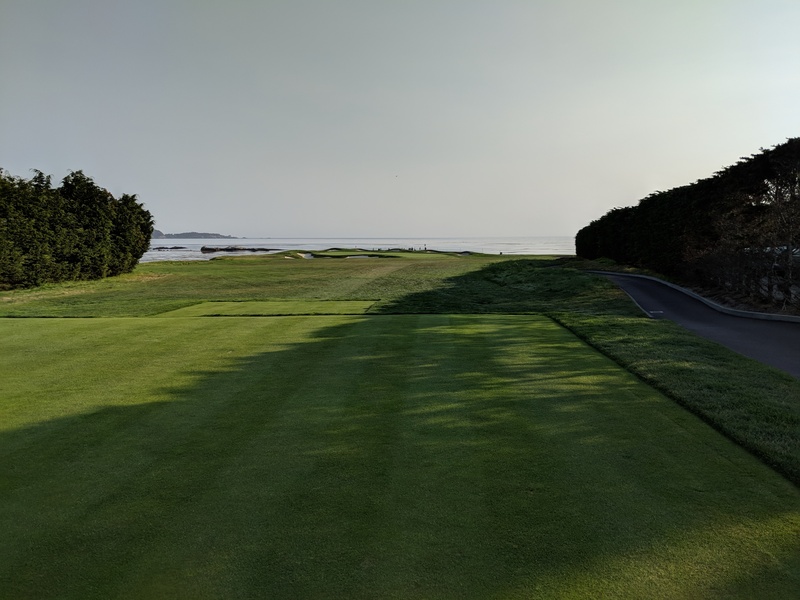 They place such an emphasis on speed that when I played we never came close to catching the white haired pair in front of us even though they were an older couple on a retirement road trip and hadn’t finished their first hole when we teed off behind them. Other courses have rangers roaming around constantly telling slower groups to get going. While I’ve been lucky enough to never have that, this is a completely reasonable idea even if it’s tough to find the right balance. I don’t know. People have their own normal paces when they play. Some are annoyed easily at being with slow players, some are annoyed playing behind a super slow group who doesn’t let them play through. Others get annoyed with people who get annoyed if a playing partner gets annoyed with them and their play speed! I’m not a fan of slow pace of play at all. I feel bad if the group I’m in is holding up the group behind, which leads me to always looking to see where they are. Most of the time I pass on playing Saturday mornings because of the crowdedness. When I play at night at Brown Deer in the evenings with the unlimited play rule, I never wait for a group and I never make someone behind us wait. The holes there are intertwined that I can find an open tee that’s walkable from the green. The only half solution I can come up with is to emphasize time at a younger age, but not in an aggressive way. When I played in AJGA tournaments over 10 years ago now, they prioritized pace of play in a very useful way. They had younger interns out there giving green, yellow, or red signs and talked about whether our group was within their time limit and close enough to the group in front. From what I recall, they weren’t pushy about it. They said faster play was important, but that it wasn’t all our faults. The USGA does it similarly with checkpoints. However, my experience makes it seem much more strict and almost as if they enjoy calling groups out for slow play. In 2017 US Am, they somehow paired me in the first group off the first tee at Riviera. You guessed it – that front nine was worrisome for me in terms of how we had to keep full time on the USGA’s pace of play rules or risk getting yelled at. The USGA is so stuck in my head that on the second hole when I had a 5 footer for par, I was too ashamed to step back and re-read after I had a different feeling standing over the ball. That’s the attitude they’ve brought to me. People talk all the time like they know the solutions to all problems in the golfing world, with pace of play being a huge talking point. But we don’t have an answer to the problem. The wording of the rule change, enforcement, judgement by the rules officials brings way too much issues to life. Slow pace of play is a good topic of discussion, but we need to realize that a real fix for this issue takes time not just words.